Of course, the archaic sounding ‘behold’ is not a common word that we would use in our everyday conversations though it is a more accurate translation of the Latin, “Ecce”. More importantly, the nuances of “Behold” convey a deeper meaning than the rather flat “this is.” “Behold” carries a connotation of contemplation and wonder. We use the word when confronted with a thing of wonder or great beauty. When the priest says ‘Behold,” there is something majestic and magnificent about what he wishes to convey as he elevates the Host. “This is”, on the other hand, has an air of mere factual statement about it but conveys no depth. “Behold,” is also an affirmation of fact, but it also contains within it an invitation, to focus on him, on the One whom we are about to receive in Holy Communion. In fact, to behold means to cast our attention on Jesus. It is more than just an invitation to see and look. The word actually means "to give one's undivided attention." Then there is the scriptural allusion which draws our attention to today’s gospel text. The new translation makes the quotation of today’s gospel text clearer, the priest invites us to see what St John the Baptist saw and wishes his disciples to see. John did not use the rather tepid words “this is”. Rather the original Greek is ‘ide,’ which is an exclamation, and is matched well in English by “behold!” The invitation to ‘behold’ helps us then to better visualise John the Baptist spotting his cousin Jesus, pointing a finger in his direction and thundering out in his loud prophetic voice that had made so many quaked, “Behold the Lamb of God! Behold him who takes away the sins of the world!” The Baptist reveals to us that he is not the object of our expectation, our adulation or our worship. The next day, John is standing with two disciples. Again he sees Jesus coming towards them, and for the sake of his disciples he repeats the words, ‘Behold the Lamb of God’. This time these words are directed to his own disciples. The Baptist acts as a kind of sign-post – testifying to the one who is greater than he. John points away from himself to Jesus. It is clear from that account that John the Baptist intended his own disciples to leave him and join Jesus. They were now to turn their attention away from the Baptist and give their undivided attention to the Jesus, the Lamb of God who takes away the sin of the world. He understands that his own ministry will end. The time has come for them to follow the Messiah. What does John expect his disciples and all of us to behold? What did he mean when he conferred on Jesus the beautiful title of the ‘Lamb of God’? First, the “Lamb of God” is not a phrase from the scriptures that is traditionally associated with the Messiah. There is one verse in Isaiah (53:7) where the “Suffering Servant” is described as “a lamb that is led to slaughter”. 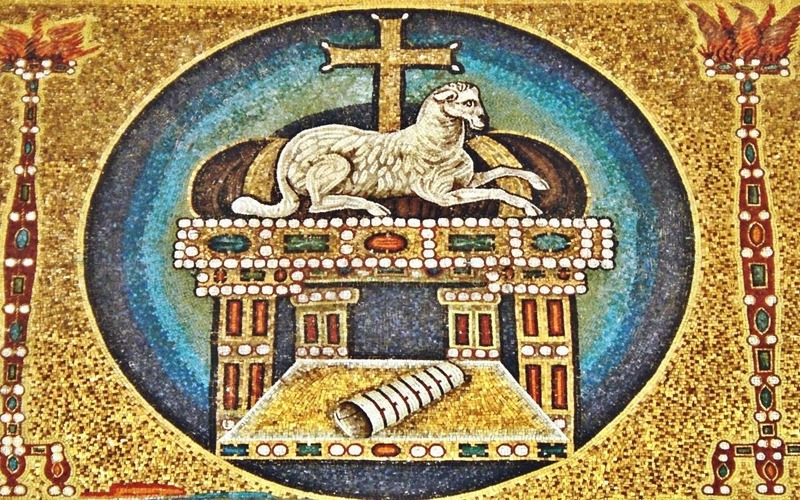 For the Jews, the image of a lamb would resonate with the sacrifices of the Temple. Unblemished lambs were sacrificed every morning and evening in the Temple as a sin offering, and also at the great annual festival of Passover to mark the great event of Israel’s liberation. John’s gospel supports this motif by stating that Jesus was slain at the very time that the Passover lambs were being killed in the Temple. But then, John does not stop with the title ‘Lamb of God, but introduces a further imagery – “who takes away the sin of the world.” This seems to recall the scapegoat, over whose head the Jewish High Priest confessed the sins of the people on the Day of Atonement. The goat was then driven away into the wilderness, as a sign that God in his mercy had removed far away the sins of the people. So added to the Passover themes of deliverance and rescue, of freedom from slavery, is the theme of atonement for our sins. The words of John the Baptist finds a parallel, a sort of parody, at the end of the gospel of John. Pontius Pilate presents him, flogged, bloodied, crown with thorns, before an angry mob crying out for his execution. Pontius Pilate announces to them, “Ecce Homo” (Latin), “Behold the Man”. This disfigured person seems too human in comparison to the idealised image of the Messiah they were expecting – a man of skin, blood and bones. “Behold the man!” Pilate didn’t know what he was saying, but John the apostle did. Jesus is the perfect man. The image of the invisible God, the beginning and the end, the One in whom all the fullness of God was pleased to dwell. The one who shows us what God always intended humanity to be like. He is the One who takes the shame of our sin and bears the mockery of evil. The masterpiece of God’s creative work. When, therefore, Pilate sarcastically introduced Jesus with: “Behold, the man!” he said far more than he knew. “Behold, the man!” — indeed! We see before not just a Man, we see before us the Invisible God, made visible! One of the great challenges of our time and even for the first disciples of Jesus was making sense of his being crucified. If he truly was the Son of God why did he suffer and die? Even the resurrection does not stifle this questioning, that Jesus rose from the dead does not make his suffering and dying any less real and problematic. But the answer to this problem at the end of the story is found at its very beginning. It was the same two disciples who had followed John the Baptist who remembered his cryptic words “Behold, the Lamb of God!” and made the connection between the innocent Jesus and the lamb of Passover; linking his passing with the events of Exodus. The first disciples of Jesus preached his death not as a defeat, but as a sacrifice that takes away the sins of the world. Their ideas crystallised around the phrase “Lamb of God” and from being something shameful the cross became their boast. That is why Christian liturgy and art show just how powerful the image of Christ as “the Lamb of God” is for Christians. If you look for a lamb with a halo, often carrying the banner of the resurrection, you will find him in Church decoration, on vestments, sacred vessels, in liturgical books and Church bulletins throughout Christendom. Our Eucharistic liturgy still echoes the prophetic words of John the Baptist; the host is elevated and the priest says “Behold, the Lamb of God” – we are to look and recognise the innocent victim whose death takes our sins away. We recall Christ’s sacrifice as the Lamb of God, we recognise that in communion we taste forgiveness and life, liberation and salvation, the fruits and benefits of his passion. We behold Christ, in whom God has taken human flesh, and in seeing – beholding – Christ, we behold God. This is not just a man who has made Himself to be the Son of God. That was Pilate’s mistake. The Baptist understood and wanted his disciples to see what he saw. This is the Son of God who has made Himself the Man, the Lamb of God who takes away the sins of the world. Ecce Agnus Dei! Ecce Homo! Ecce Deus! But a powerful article nonetheless. Sometimes these moments in the Holy Mass become so routine that their beauty and immense significance is lost. So much of the modern liturgy can be focused on us, to the detriment of the glory of God through the Sacred Mysteries of Christ's sacrifice. Bless you, Father, for this amazing blog.